When only one male sockeye salmon returned to spawn in Redfish Lake back in 1992, he couldn't have known he was about to save future generations of his species. Because he could find no females in the lake that year, the lone fish who had survived a journey from Idaho to the Pacific Ocean and back was nicknamed "Lonesome Larry." 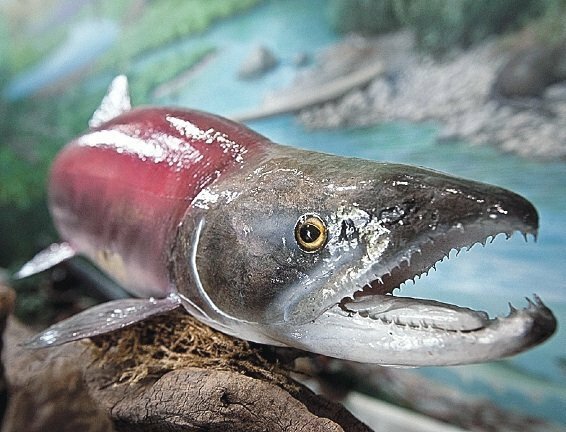 Larry became famous and a symbol of the struggle for Idaho's anadromous fish species -- steelhead and salmon -- that spend their lives in freshwater and the sea. Friday morning as the new Springfield Fish Hatchery between Aberdeen and Blackfoot celebrated its opening, Larry became a symbol of triumph over extinction. "This represents so much more than the construction of a fish hatchery," said Idaho Fish and Game's Chief of Fisheries, Ed Schreiver. "It is arguably the largest success story of the recovery of an animal." Redfish Lake, located at the base of the Sawtooth Mountains in Custer County, got its name because of the fish that spawned there. Sockeye turn bright red during the spawn and were so abundant that the alpine lake literally turned red. As dams were constructed along the lower Snake and Columbia Rivers, those numbers began to decline until Larry was the last one to make the trip home in 1992. Shoshone-Bannock Tribal members and the Idaho Department of Fish and Game had already sounded the alarm -- sockeye salmon in Idaho were about to disappear. "It was unacceptable to have a large part of our culture removed," said Shoshone-Bannock Director of Fish and Wildlife Chad Colter. "This is a great day for Idaho sockeye." Shoshone-Bannock and Idaho fisheries experts netted Larry and extracted his sperm for preservation. Soon the few remaining salmon who came in 1993-95 where captured and eggs were taken. Then efforts were made to net brood stock and save the genetic lineage of the Redfish Lake sockeye. Scientists were skeptical about the effort to save this strain of salmon. "They were told they couldn't restore genetic diversity and we proved these people wrong," said Lorri Bodi, vice president of Environment, Fisheries and Wildlife for the Bonneville Power Administration, BPA, which funded most of the $13.5 million Springfield Hatchery project. It is part of the mitigation efforts initially required by the Northwest Power Act of 1980. Early efforts paid off handsomely, according to Idaho Fish and Game Director Virgil Moore. Moore worked with the salmon recovery project early in his career with Idaho Fish and Game. "I have a tie to this program from the time I was touching Lonesome Larry," Moore said. "If it hadn't been for the tribe taking the initiative, we wouldn't have had the resources." The effort to save the salmon in the Stanley Basin of Idaho became a massive joint effort between the tribes, Fish and Game, BPA, the Northwest Power Council, National Oceanic and Atmospheric Administration's Northwest Fisheries Science Center and state and federal politicians. A decision to pursue a new salmon hatchery in Springfield received the backing of both Gov. James Risch and Gov. Butch Otter. "It's really a story about people and partnerships," Schreiver told the crowd gathered for a ribbon-cutting ceremony. "It's a testament of perseverance for the fish and people," Bodi echoed. The new state-of-the-art hatchery was built on about 73 acres of land donated by the Linda Jahnke family. In a unique approach, , the contractor, McMillen, LLC, and Idaho Fish and Game worked together from the ground up to design the facility. Six wells draw artesian water from the property high up into a pumping tower and the water is then filtered through a series of rings to remove dissolved nitrogen. The well water is at 52 degrees. Before it reaches the incubation station inside the hatchery, it is cooled to 45 degrees. Once the eggs hatch, the smolts are placed in 22 tanks inside the building until they reach about three inches in length. They will then be transferred to 22 covered and enclosed raceways outside until they reach the size needed to be planted in Redfish Lake. Eventually other lakes in the Stanley Basin that once were spawning grounds will receive stock. Hatchery superintendent Doug Engemann said the hatchery compound includes a shop and three residences for the full time employees at the hatchery. A public fishing pond adjacent to the hatchery will be stocked with rainbow trout in the near future. It will also employee three additional seasonal workers. Engemann said the best thing about the new hatchery is it is designed to protect the young salmon from any contamination. He his hoping to produce 200,000 sockeye for a trip to Redfish Lake in the next year and boost that production to 1 million within four years. The goal of both the Shoshone-Bannock Tribes and Idaho Fish and Game is to be able to harvest sockeye from the Upper Salmon River drainage beginning eight years from now. "It's the culmination of meeting the needs of the sockeye," Moore said about the hatchery project. "It's the sockeye themselves that hung on so we could get to this point." "This is magical, but it is not magic," Schreiver said about the effort to save the sockeye and the future progeny of Lonesome Larry.